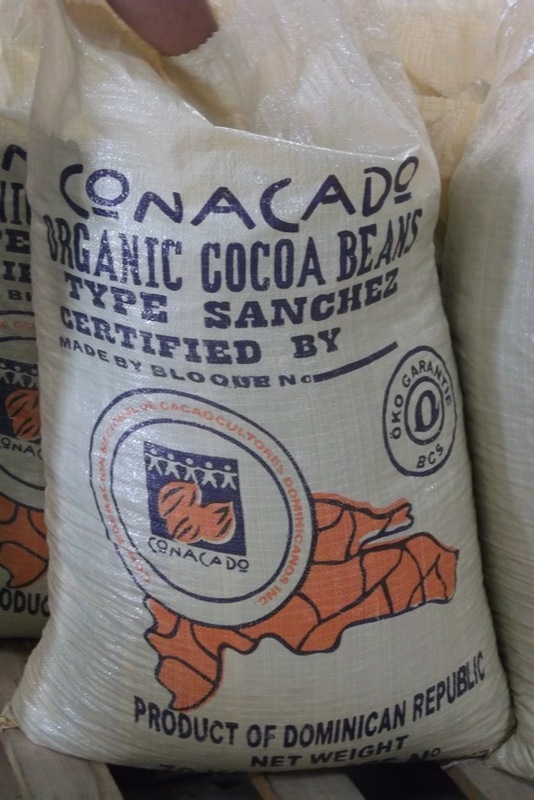 Here’s blog #5 on my cacao trip to Grenada and the Dominican Republic (DR), covering a visit the CONACADO cacao cooperative’s offices and northwestern producer communities. This is a bit long, as it’s meant to inform those interested in the details of the cacao sector, and bring alive the people, places and experiences I encountered. See an overview of the trip and its purpose. Sunday 1/22/12 (First day in DR): I landed in Santo Domingo, settled in at Hostal Nomadas, and went out to explore the vicinity and find some food. I stayed in the Zona Colonial, which is on the south edge of the City along the Caribbean and has many well-preserved/restored Spanish colonial buildings and museums (great for those interested in history, architecture and culture). It’s known as one of the safest areas in the City, due to the presence of many tourist police. Being Sunday in a predominantly Catholic country, most stores were closed. However, several restaurants and souvenir shops were open on El Conde, a shopping and tourist hub. This pedestrian-only street has benches and tables where locals played chess and checkers as they enjoyed the late afternoon ambience. Parque Colon and an old cathedral sit at one end. Locals and tourists alike strolled the park as the early evening light gave the cathedral a beautiful golden hue. Tourists filled several restaurants across from the park, drawing roving musicians playing merengue and bachata. Finding a tiny corner store that was open, I bought some deliciously rich cornbread made with coconut milk, which had a consistency between cake and bread pudding. I’m generally not a coconut fan, but this was incredibly delicious and something I sought out again. The store owner’s son said his Grandmother made it fresh. What a lucky grandson—and customers! 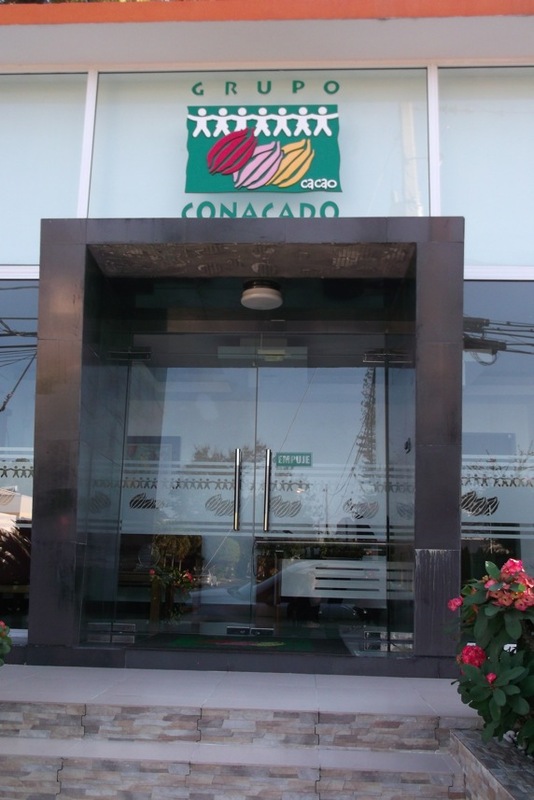 CONACADO (National Federation of Dominican Cacao Producers) is a 10,000-member cooperative founded in 1988. It’s of particular interest to me due to its manufacturing of semi-finished cacao products (liquor, butter, powder, nibs) and its multiple certifications (FLO Fairtrade, Rainforest Alliance, Utz, USDA Organic, BioSuisse, EU Organic and Biodynamic, among others). Producers are grouped into seven bloques across the country and elect a governing body for their bloque, and the cooperative. By pooling their production and investing in shared services, the producers can export cacao directly—unlike many farmers who sell through one or more middlemen. I met Abel around 2003, when I was working at Global Exchange and organized a national Fair Trade cacao speaking tour featuring him. The stories he shared inspired me to work to improve producer livelihoods since, and motivated this trip. We discussed the cooperative’s structure, markets, certifications and goals, and a plan to visit producer communities. 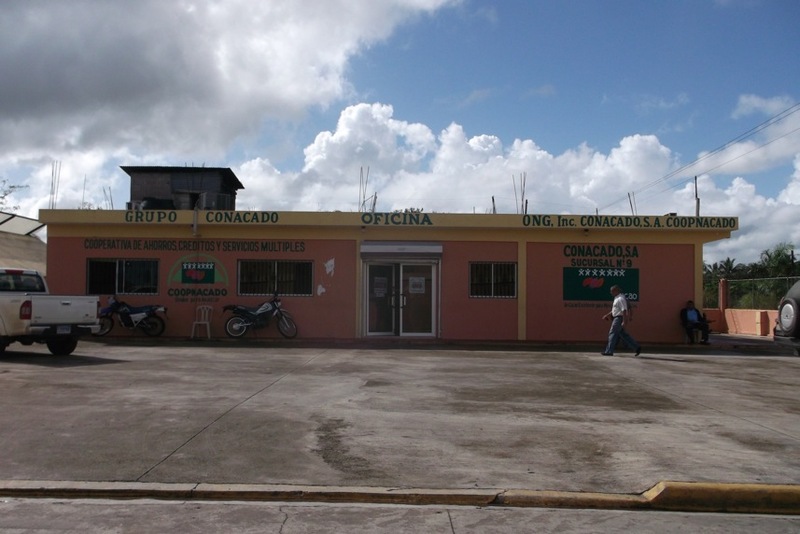 CONACADO comprises the producer-owners, a processing operation, administration, export and a credit union. Current goals include increasing efficiency and growing sales of semi-processed products. Abel noted some formidable challenges with the latter: the industry’s model of purchasing beans to process elsewhere is firmly entrenched, many buyers perceive origin processing as being prone to higher microbiological levels and lower quality (since other countries export their best cacao and process lower quality in-country), and brands prefer to control processing. Abel and a colleague who manages certification shared that, as the mainstream market has embraced certification, more buyers view it as a baseline expectation and are not willing to pay the price premiums the co-op has received in the past. Growth of certified supply is also certainly reducing producers’ negotiating power. (Note – No certification except FLO Fairtrade guarantees a minimum price, and the world cacao price has been above the FLO Fairtrade floor price for years, making that the effective floor. FLO Fairtrade involves and added social premium, but that’s for cooperative, social and farm development projects only, not farmer income. Many producers use some part of it to pay certification fees, reducing effective benefits to producer communities.) Changing dynamics in the fair trade landscape, such as the increase of large farms, and buyers’ increasing involvement in allocating fair trade premiums have further impacted small producers. After the meeting, I visited Parque Colon, took in the neighborhood’s evening happenings and checked out the major grocery, Jumbo. The DR has many more domestically produced foods than Grenada, including a few brands of hot cocoa, drinking chocolate blocks and eating chocolate (with lots of sugar and vanillin). 1/24/12 (CONACADO NW – Factory & Bloque 8): The day began with a 2-hour bus ride to San Francisco de Macoris (SFC), gateway to the country’s northwest, and largest, cacao region (61% NW, 20% E 10% Central). We traversed verdant country with mountains, rice fields, cattle pasture and other agriculture. Jaime Gomez, who manages agronomic training/improvement and development projects for five CONACADO bloques, met me in SFC. He’s a co-founder of CONACADO, and founded two of its bloques. He has deep experience and expertise, and I truly appreciate the generous time he shared. 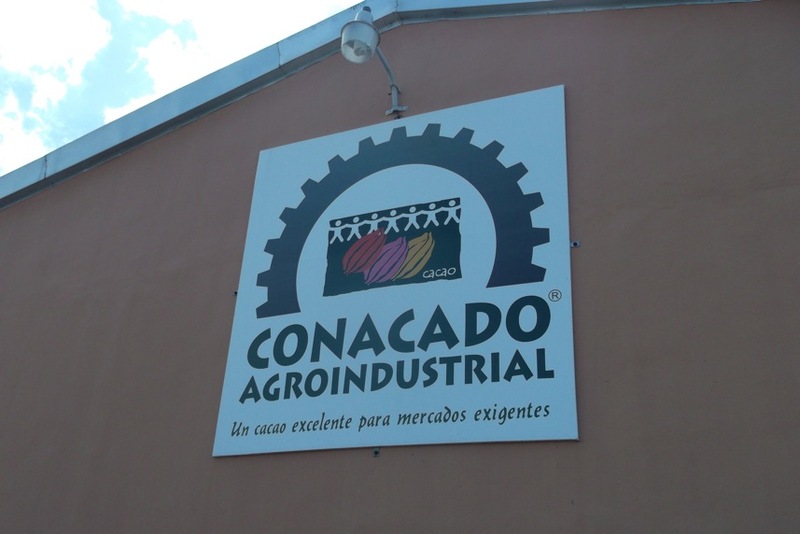 Our first stop was CONACADO’s factory (see more photos) in SFC, used to make semi-finished products. 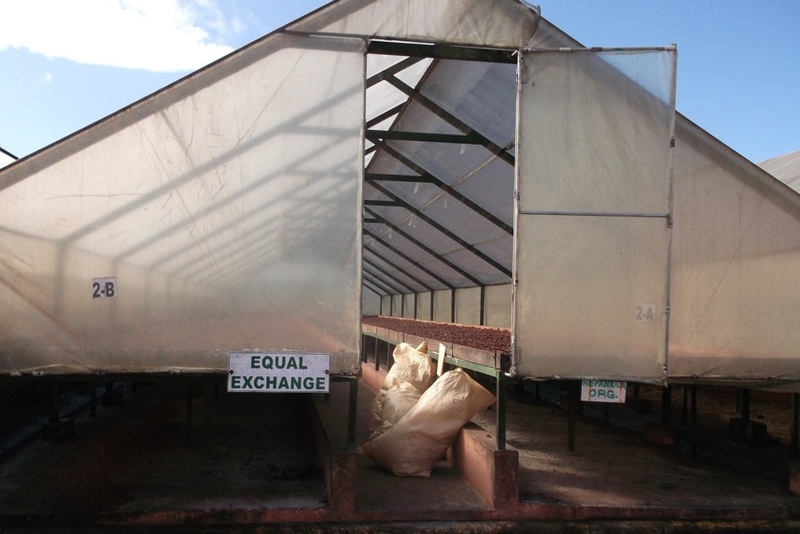 It’s an impressive and inspiring operation for smallholders to own. Several wood- fired drying bins—a large open circular unit and closed drums—sit outside (beans must be dried to 7 percent moisture). A machine to sort beans from chaff also sits outside the factory wall, with conduit directing cleaned beans inside. Processing equipment includes standard machines such as a winnower (breaks beans, separates shells from nib/bean pieces), roaster, grinder, refiner, cocoa butter press and cocoa powder machine. A closed piping system moves product through each step without contamination. The plant processes only organic, and both alkalized and non-alkalized powder. It has 25 employees, representing a great economic boost to the community. For many employees, it’s their first job with a company. The plant is in an economic development zone with several other ag plants that are absolved of their tax burden, incentivizing job creation in low income rural areas. Semi-processed products represent only a small percentage of the co-op’s sales and production is below capacity since demand isn’t higher, representing a significant marketing need and opportunity. Equal Exchange uses CONACADO’s powder in their baking cocoa and hot cocoa. Buying this kind of product delivers a real economic boost to small-scale producers and their economies. After this, we visited a cacao nursery (see more photos) run by Jaime, which produces hybrids from seed (trinitario and criollo blend), and grafts of trinitario and criollo. 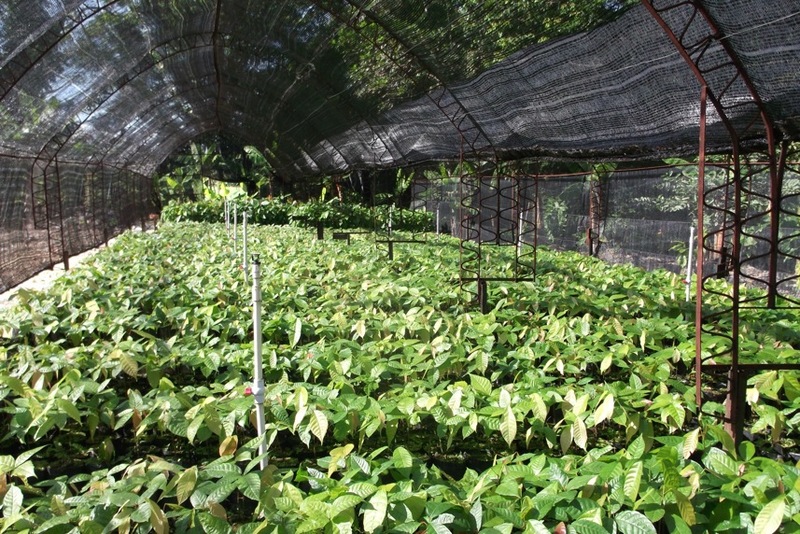 The nursery has a small test plot and clonal garden with cacao varietals, fruit and leguminous trees. 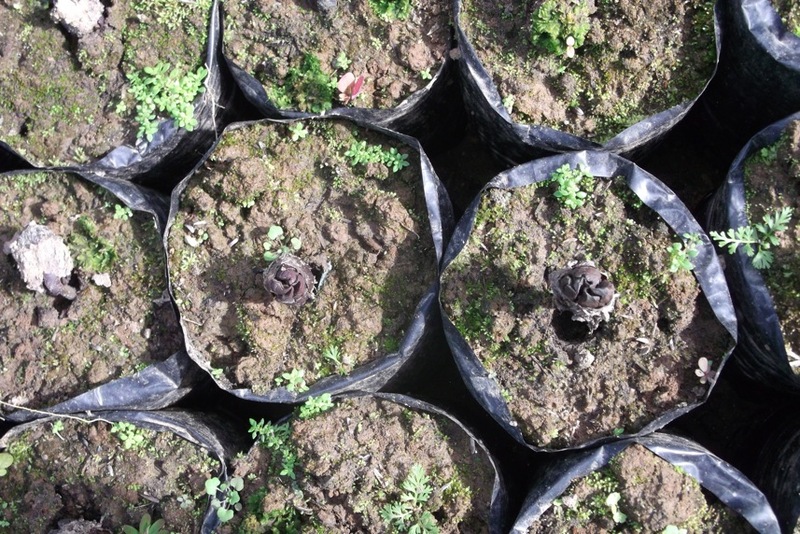 Seed germinates in about a week, and the bloque delivers trees to producers to transplant when they’re three months old. Our next stop was the Bloque 8 Center (more photos from Bloque 8) in Castillo. 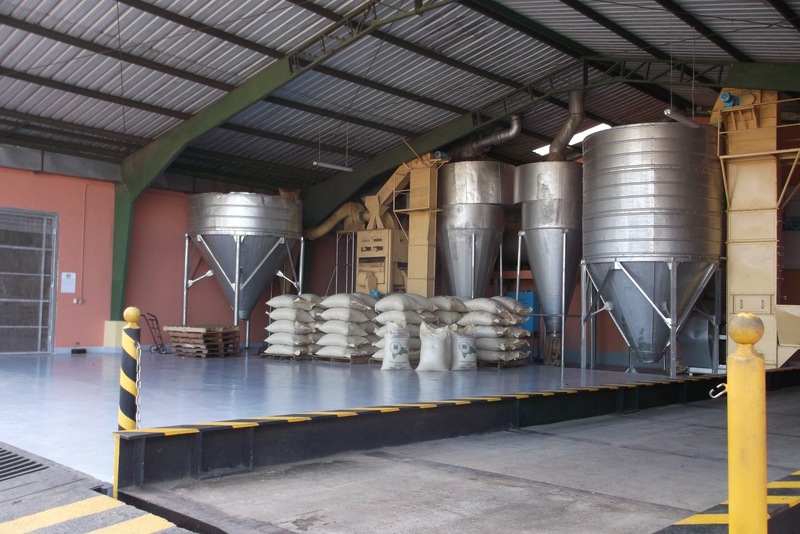 Each bloque has one of these, serving as the point of sale for farmers, a central fermentation and drying site for the co-op, and the home of the bloque’s administration and credit union. The Credit Union’s interest rates are 1.5% vs 2.5-3% at banks, and it makes loans possible for farmers who may lack land title (due to added costs), and thus have no loan collateral. Everyone welcomed Jaime warmly and he remarked later how it felt like a big family given his extensive, longtime involvement. Bloque 8 has 468 members (260 organic) with an average farm size of 5 ha and average production of 450 kg/ha (industry range 320-960, average ~ 500). 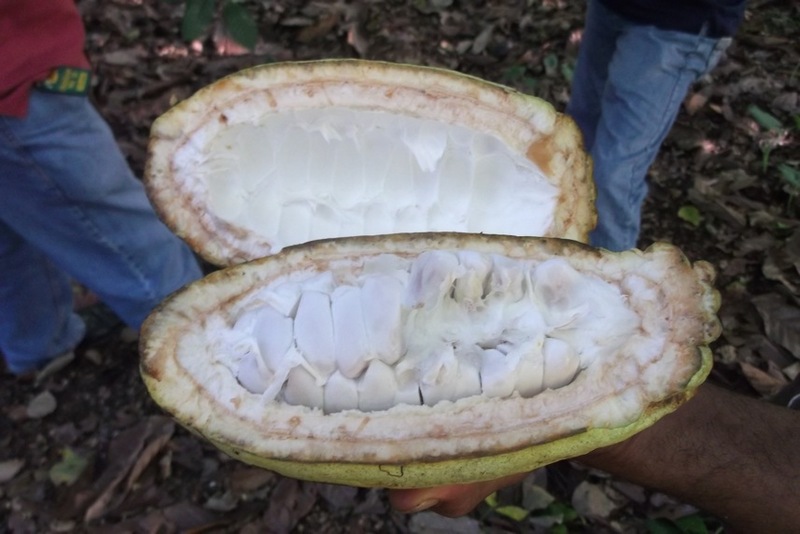 Most farmers sell wet cacao (fresh beans in pulp) for centralized post-harvest processing, rather than processing it themselves, ensuring higher, more even quality. Most farmers deliver, though bloque workers pick up if needed. It must arrive at the Center within four hours of harvest to maintain quality. Producer prices are based in the daily market and bean quality, rated as Grade 1 or 2 beans. They also get an annual bonus, dependent on revenue. 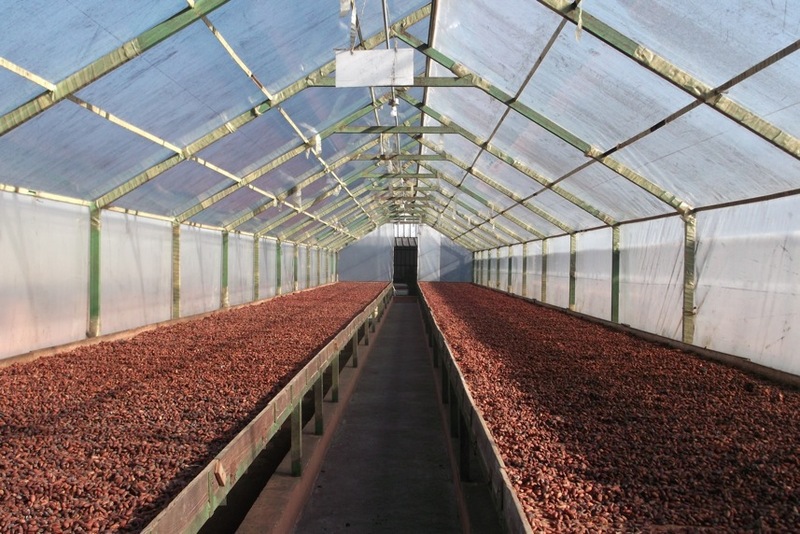 Wet cacao is dried if it will be sold as unfermented (“Sanchez”), or fermented for five days under plastic sacks if it will be sold as fermented (“Hispanola”). 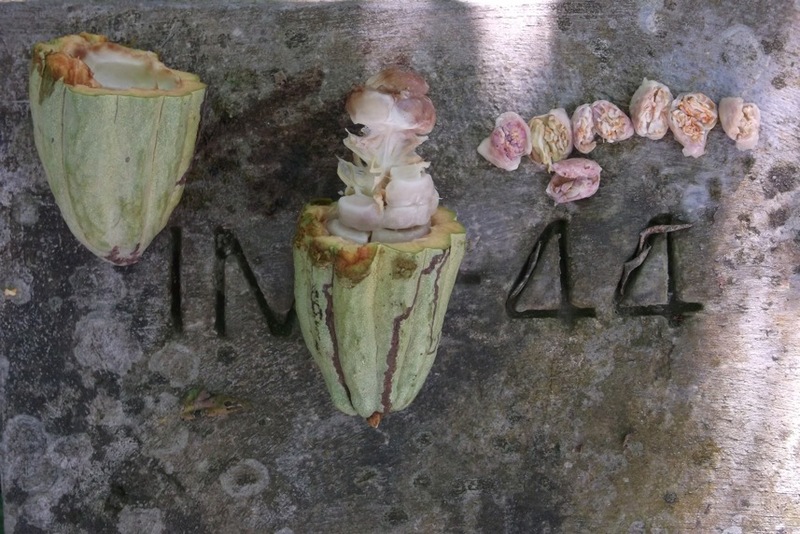 The cacao cycles through three fermentation boxes, one day in the first and two each in the following two. The boxes are tiered for easier work and even fermentation (i.e., beans on top of one box easily transferred to the bottom of the next). To cap off the day, we visited one of the first farms to join the bloque (see photos). It was diversified, as is typical for CONACADO’s members, with pigs, chickens and citrus as well as cacao. We enjoyed sucking the pulp off cacao beans (always my favorite) and oranges peeled in a spiral with a machete, an art and a treat. 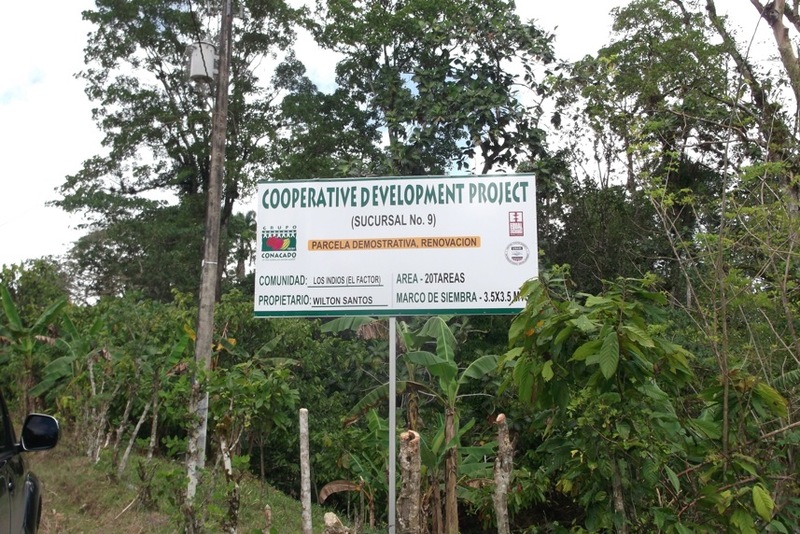 The co-op is rebuilding the family’s home with FLO Fairtrade premium funds ($200/metric ton above bean price, to be used for social or farm development as voted upon by producers). Jaime told me about other Fairtrade premium projects such as installing pipes to bring water to homes, building and rebuilding schools, constructing an athletic area for a school and supporting a women’s association in making products to sell. Bloques request funds for projects annually and the national office reviews proposals and determines allocation. Some Fairtrade buyers also influence funding allocation by requiring proposals to approve and requesting progress reports, desiring concrete results. Wednesday 1/25/12 (CONACADO NW– Bloque 9 and IDIAF Research Center), After a hotel stay over in SFC/Castillo, I took a short, early run to get a feel for the area, packed some breakfast to go, and jumped in the car with Jaime to head north to Bloque 9 in Los Pajones. Along the way, we discussed current funded development projects, which tend to focus on quality improvement and critical social needs. Quality efforts include improving tree stock, especially replacing forestero varietals with trinitarios, post harvest training and setting up facilities to make beans into liquor for taste tests. One significant effort is a five-year joint venture between USAID, TCHO and Equal Exchange (EE) involving 2,000 CONACADO members (see below). Jaime is also developing projects with other chocolate companies, including Cocova (productivity improvement using high yield grafts/clones with different flavor profiles, tested on five demo farms,) and Green & Black’s (funded through FLO fairtrade premiums—productivity improvement and social projects such as school building/improvement, water pipe installation, rebuilding homes) and ICAM (processor/co-manufacturer). Green & Black’s has also sent volunteers to help install a community water line and plans to implement further volunteer projects at origin, representing another positive model. Our first stop was Bloque 9’s Center (see more photos). The bloque has 1017 members, 76% of which are organic and Rainforest Alliance (RFA) certified. The average farm is 3.5 hectares, yielding an average income of $410 US per month. The bloque’s current needs are drying space, communication, particularly for emergencies, and farm improvements (productivity, farm management1, shade management, pruning, better tree stock). At the Center, I saw CONACADO’s system for tracking (“internal control” in certification lingo) related to certifications. They use software to track deliveries by farm, with each farm’s certifications and other data noted (e.g., involvement in EE-THCO-USAID project), allowing them to generate reports by certification and other parameters. Staff also train and assess producers to help them get certified, and audit farms to self-report for annual recertifications. (Some certifications allow self-audits/reports.) This brought home the reality of the resources involved to obtain and maintain certifications, and fulfill reporting requirements for certifiers, customers, funders and others. I also got a glimpse of Jaime’s excellent project management system when he shared the overall workplan and detailed implementation plan (farm selection methodology, farm activity plan, etc.) for the EE-TCHO-USAID project, which involves 160 farms in the bloque. Outside, we walked through the fermenting and drying areas, and talked to the QA staff. QA does a visual inspection to assess overall bean quality and the proportion of white (desirable/fresh) versus black (not) beans. 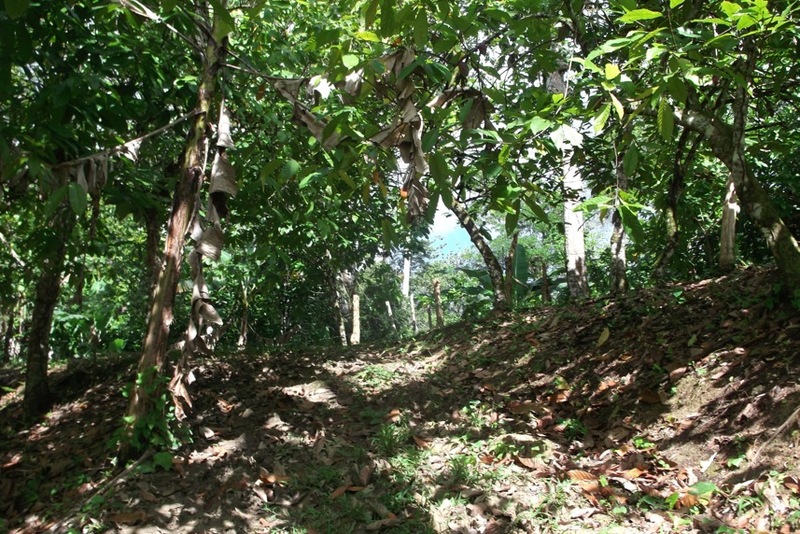 Lower quality cacao is generally used for Sanchez (unfermented). Here, fermentation bins have four levels, doubling capacity Liquid from fermentation is currently drained off but the bloque wants to capture and digest it into biogas. Here, beans are dried for three days in sun then finished in an artificial dryer powered by wood from producers and local tree farmers. 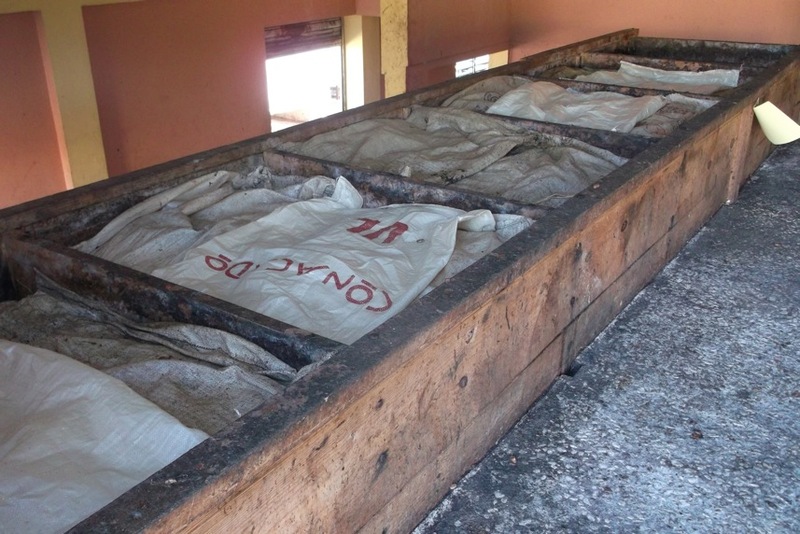 Dried beans are cleaned to remove chaff (in a wood fired machine) and bagged for export or processing. Project test plots are located on producers’ farms and serve to evaluate varieties and agronomic practices for wider adoption, and provide hands-on/experiential learning for famers. Test plot activities include replacing old trees, pruning, weed control and shade management, with maintaining biodiversity serving as a foundational guide. 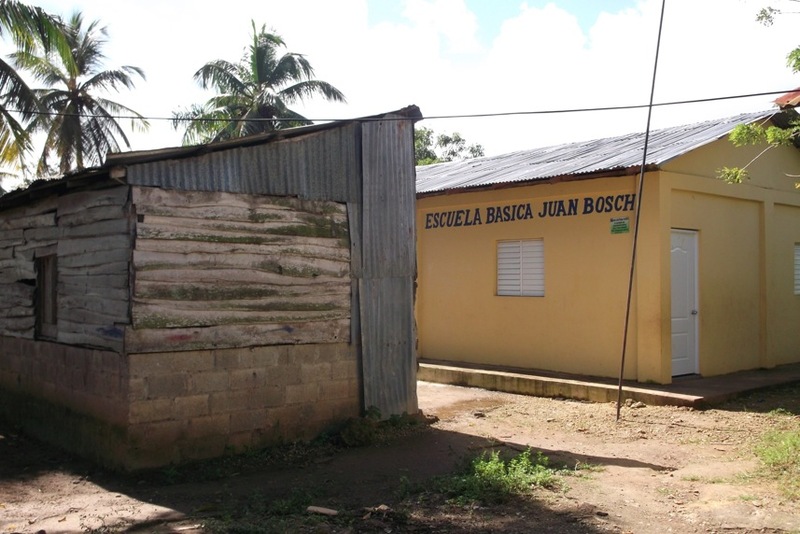 We then visited a producer community (see more photos) and saw a small two-room school that was built with FLO Fairtrade premium funds to replace an old, deteriorating school next to it (new construction costs about $400 US per sq meter). The adjacent homes were clearly in need of repairs or improvements. After this, Jaime, the QA manager and I enjoyed lunch in Nagua on the north coast, which is also home of the La Red Guaconejo cooperative (TAZA Chocolate is doing great work with them). We ate at Chen restaurant, featuring typical Dominican food (beans, rice, guandoles, tostones…mmmmm), seafood and, of course, the DR’s own Pesidente Light beer (a light, bubbly pilsner served quite chilled). The ocean view was beautiful. After lunch, we visited IDIAF (Instituto Dominicano de Investigaciones Agropecuarias y Forestales – Dominican Research Institute in Agriculture, livestock and Forestry) (see more photos) where one of the cacao agronomists guided us around the site. 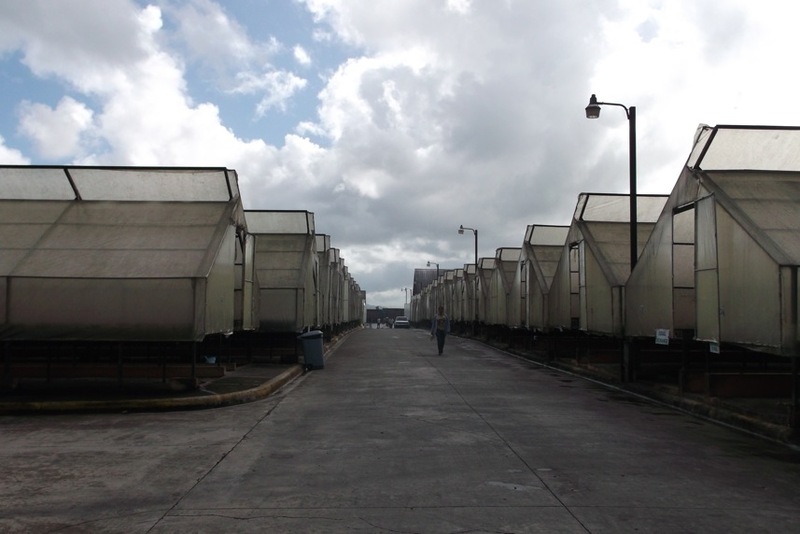 This serves as an important gene bank and research center for many of the country’s crops. 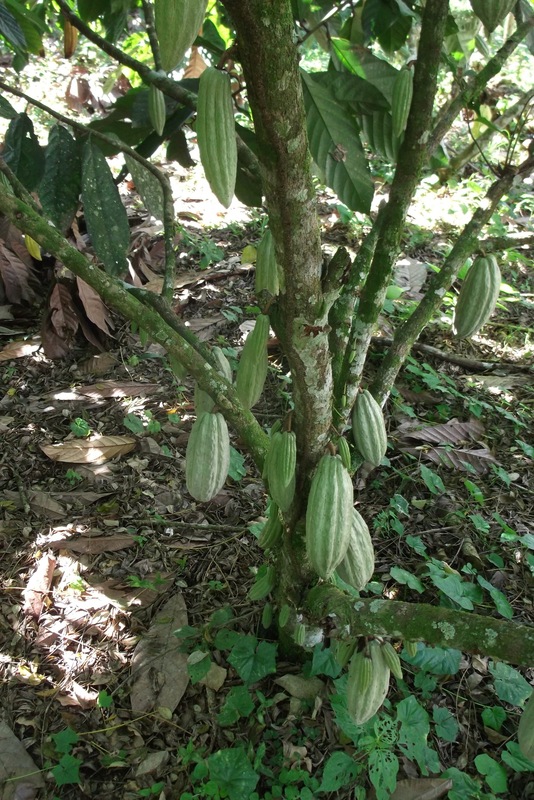 It has four hectares of cacao planted with 59 varieties from across the Americas (and beyond?). Seeing and tasting different varieties was fascinating. 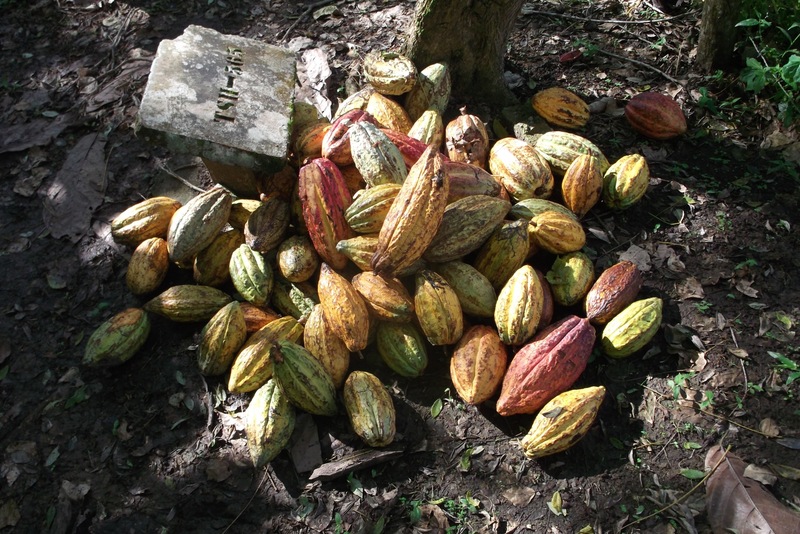 The spread of cacao diseases in other countries has hampered the acquisition of further varietals, since the country can’t afford to risk its cacao production by bringing in affected trees. A given varietal is planted in different growing environments (e.g., amount of sun) and managed with different agronomic practices (e.g., pruning) to evaluate how these impact productivity and crop qualities. Researchers in the US and Puerto Rico have assessed each variety’s DNA and flavor characteristics to optimize breeding and production practices. IDIAF also does quality and flavor testing on cacao for processors and brands, and produces grafted cacao trees and seed from its stock. This concluded my visit. After profusely thanking Jaime, I hopped on the bus to Santo Domingo. We had to switch to another bus after a breakdown en route, which Caribe Tours and the passengers handled quite smoothly. Not yet over-cacao-ified, I stopped at Jumbo Grocery to get some domestic cacao powder to try. There are two main brands, Sobrino (Cortes) and Munnei. Both are alkalized and add soy lecithin. I tried the Sobrino, which was quite astringent and dry. This entry was posted in Agriculture & Food, Chocolate & Cacao, Sourcing & Supply Chain and tagged certifications, chocolate-cacao, CONACADO, travel. Bookmark the permalink.